Implementing ITIL® can revolutionize your business, but how will you manage the revolution? Organizational change is difficult to manage and takes time. The implementation of ITIL strategy and process can be particularly challenging, especially for organizations where it represents a radical change. So how do you ensure that the process goes smoothly and offers a return on your investment in the ITIL framework? Fortunately, help is at hand. Advanced Organizational Performance Techniques™ (AdOPT™) announces the release of ITIL® and Organizational Change, by Pamela Erskine which fills a growing need in the ITSM community. 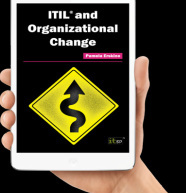 Pamela Erskine has more than 15 years of experience in IT and Service Transformation, and now she is sharing that knowledge in her new book, ITIL and Organizational Change. Published by IT Governance Publishing, ITIL and Organizational Change covers best practice in gaining acceptance of changes in the workplace and gives practical advice on applying organizational change models to an ITSM initiative. Pamela acknowledges that not all organizations and projects are the same, so she covers five change models that suit different needs. “The IT organization is undergoing significant changes to their operating model. Increased customer expectations and rapidly changing technology require them to seek opportunities to improve efficiency and effectiveness. With so much practical advice and first-hand knowledge, this is essential reading for anyone who wants to their ITIL implementation to run more smoothly. ITIL and Organizational Change can be purchased in multiple formats (including softcover, Adobe eBook, Kindle and e-Pub) from: www.itgovernance.co.uk/shop/p-1272.aspx (UK), www.itgovernanceusa.com/product/2623.aspx (US), www.itgovernance.eu/p-960.aspx (EU,) or at www.amazon.com. ITIL and Organizational Change is now available. Order your copy today!